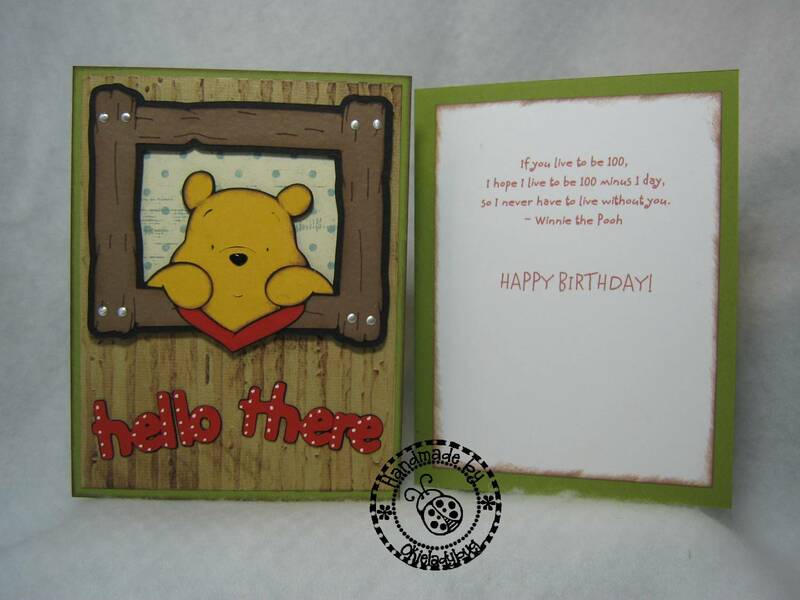 For this card I did use both Pooh and Friends and Pooh Font. I wanted to make it look like Pooh was looking out a window so I used some patterned paper for backing. I think I should have chose some different paper, but oh well it is done now! A Stampin Up! marker was used on the grain of the wood for a little more definition. The full card mat was ran through the Cuttlebug using the Distressed Stripes folder, that is one of my favorites! I did do some shading on Pooh and I think it made him look a little better and not quite so stark. I used some hot fix studs for the nails on the wood window frame. For the inside sentiment I found a quote of Pooh *okie giggles to self because that sounds funny to her and she is silly* that says "If you live to be 100, I hope I live to be 100 minus 1 day, so I never have to live without you" and then it says Happy Birthday. I figured what a way to tell someone happy birthday! I did use Microsoft Word to print the sentiment and my friend Linda taught me how to do them in Hallmark Studio so I can get the right size and print them all at once. I just had to trim the sides and bottoms of the cardstock for the proper fit for the inside of the card. Stay tuned tomorrow for the second card of the series!! Very cute Okie! All of the Pooh cuts are much easier than the Tinker Bell cuts! That is my favorite Winnie the Pooh cut that you have used! I made an anniversary card for my hubby one year with that quote. Can't wait to see card #2 in the series! I love your card!! I am a huge fan of Winnie the Pooh!!! Thank you for sharing!! I totally LOVE your POOH card! I'm a long time fan of Pooh so this is really great. You are so creative in putting together the beautiful cards with just the right saying. Thank you so much for sharing. Really cute!! I love that quote too. I absolutely love this card!!!! He just looks so cute looking out the window, TFS!!!!!!!! I love these carts! They were one of the first ones I bought when I first got my E. There are so many things on the Pooh and Friends cart that you can use and the Pooh Font is one of my favorite font carts. I love your card. Have fun playing! That's really cute! Too bad I don't have the Pooh cartridge or Shutterbuggin would be right! The CB background really makes it look good and putting the marker on the window frame sets it off a lot. Ohhh Pooh is just the cutest!! Can't wait to see the rest of the series...oh and just thought I'd let you know..the cricut replacement blades are 6.54 at walmart.com with free site to store shipping..and the mats are 6.54 and 10.54 also with free site to store. I've always loved that sentiment...so sweet. I thought you were never going to get a chance to play with this cartridge. I am looking forward to the series! Very cute Okie. I love pooh and I too have a really hard time with the Tinkerbell cartridge. Okie - Your Pooh is so cute (that really sounds weird and icky). Anyway - thanks for sharing. Hope that the paperwork was not too bad today. I love this card! It's so cute, and I always thought I hated Pooh so I would never add his cart to my wish list, well it's been added. So cute! I love Pooh! I'm gonna have to get these carts someday soon. LOL @ Tina, girl ya know Linda steals my stuff all the time! Super cute! I love Pooh! This card is so cute! I can't wait to see more. I love the Pooh carts, they are adorable images and all very easy. If you find that endless supply of mats and blades, you better share with us!!! This must be my lucky day! I just happened upon your blog and have had a wonderful time. Your projects are great, very inspirational and lots of fun. But your sense of humor is a riot!!! Thanks I needed that. This is such a cute card! My Pooh and Friends Cart hasn't arrived yet. I'm eager to start using it. 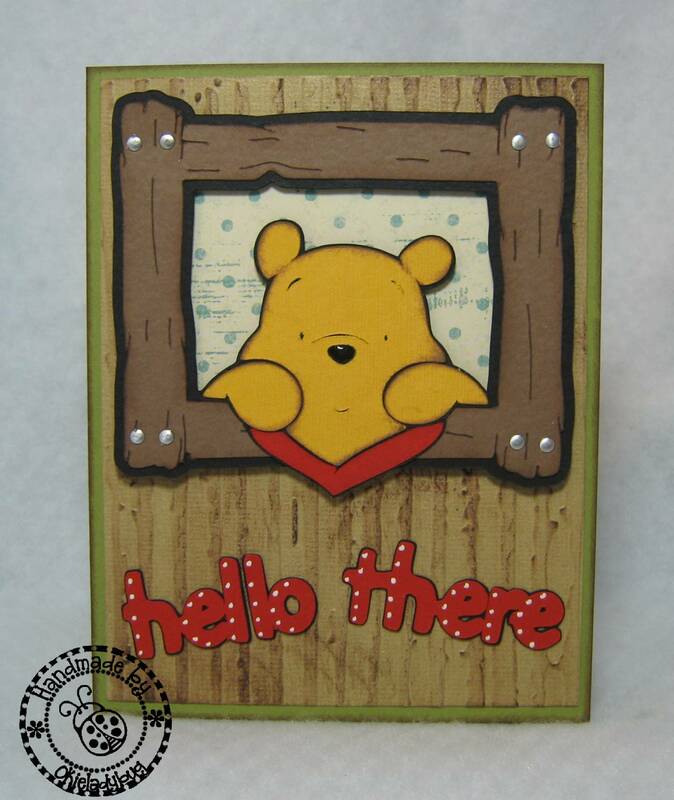 Awwwww ...This Pooh card is adorable ... don't you love that sweet lil face!!! And the start of a series too! WHOOO HOOO! This should be fun! Can't wait to see what you do with Pooh and all his Friends in the Hundred Acre Wood! This is really adorable! I think the Pooh ones are the easiest of the Disney ones to cut. I like how you shaded him & that quote is really great! Another cute one! Keep them coming, Okie! Your Pooh card is adorable. Love the inside quote. Your shading really made Pooh. Now, Okie! You know I just "borrow" your ideas for personal use! LOL! I love your Pooh cards. You just crap me up....because of you I didnt buy that cart! 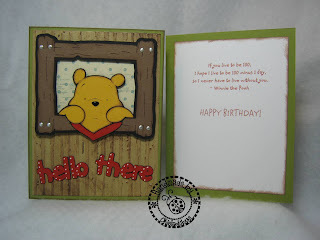 Pooh is my idol, I just love these cards and your blog, you are such an inspiration to me. OMGosh....h's so sweet! It's simply ADORABLE! That is an awesome cart - you will enjoy it for sure! OK OK OK, you've convinced me, I need this cartridge! Thanks for sharing all these cute cards.